“Remembering Boyle Heights” traces its history, triggered by current debates over gentrification. Few neighborhoods in Los Angeles have seen the kind of diversity and demographic shifts that have essentially defined Boyle Heights. Americans, Russians and Japanese. Internment of Japanese Americans during World War II marked a major shift in the racial makeup of the area, and by the beginning of the 2010s, more than 90 percent of the residents were of Hispanic origin. In recent years, the economic forces of gentrification have been the focus of vociferous debate and have led many to a re-examination of what it means to be part of Boyle Heights. 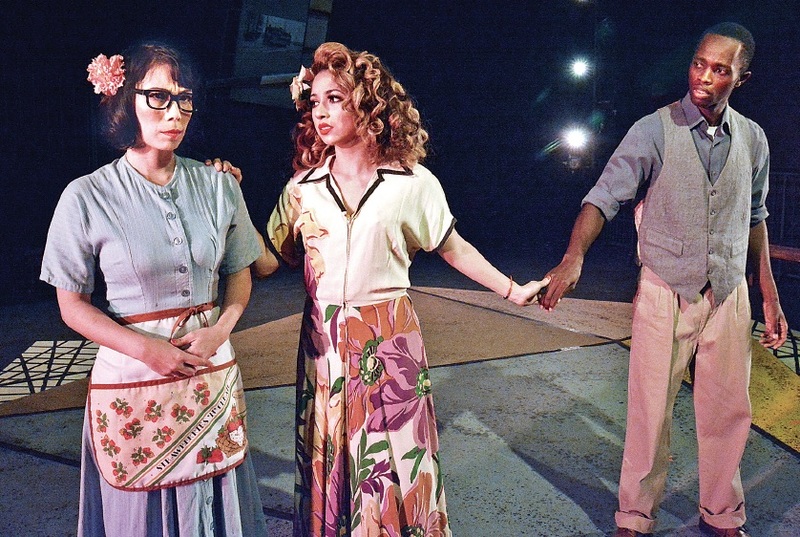 “I didn’t know the history at all,” admitted Megumi Kabe, who is part of the ensemble cast of “Remembering Boyle Heights,” an interactive visit and celebration of the neighborhood that opened for a six-week run Nov. 9 at the Casa 0101 Theater. “Since I go to Little Tokyo quite often, I knew a bit about Boyle Heights, but I was surprised at how much history and Japanese culture that is rooted there. As part of the cast, I’m learning a lot,” Kabe explained. Co-written by theater co-founder Josefina López and Corky Dominguez, the show arises out of the current gentrification debates to unlock the\ early history, stories and memories of Boyle Heights, revealing the mythical and human dimensions of L.A.’s own Ellis Island of the West. “From the beginning of the century to right after World War II, we explore this time period during which Mexican, Jewish, Japanese, Armenian, Italian, Russian and African American communities co-existed in Boyle Heights,” López said. The cast, as diverse as the storyline, also includes Michael Berckart, Joe Luis Cedillo, José Alejandro Hernandez Jr., Yvette Karla Herrera, Ángel Michel Juárez, Marcel Licera, Jackie Marriott, Roberta H. Martínez, Allyson Taylor and Raymond Watanga. Dominguez said this world premiere will take audiences on a truly unique theatrical journey. “They will be led by a tour guide, and in the process everyone will learn more about the evolution and history of Boyle Heights, from its rich cultural diversity and ethnicities of the past, coming full circle to the current gentrification of the community today,” he explained. Kabe said she was particularly touched by how neighbors watched over the homes and businesses of Japanese Americans who were incarcerated by the government during the war. Kabe hopes audiences will not only enjoy the production, but will also be awakened to the value of protecting neighborhoods like Boyle Heights. “Remembering Boyle Heights” through Dec. 16. Performances will be staged at Casa 0101 Theater, 2102 E. First St. (at St. Louis Street) in Boyle Heights. Tickets during the six-week run are $20 per person for general admission; $17 per person for students and seniors; and $15 per person for Boyle Heights residents. Discounts for groups of 10 or more will be available at $15 per person. This show is recommended for all audiences. Advance reservations are highly recommended. Free parking is available on several streets surrounding the theater, and Fridays and Saturdays only at the Boyle Heights City Hall Parking Lot. For tickets and information, call the Casa 0101 Box Office at (323) 263-7684 or visit www.casa0101.org.